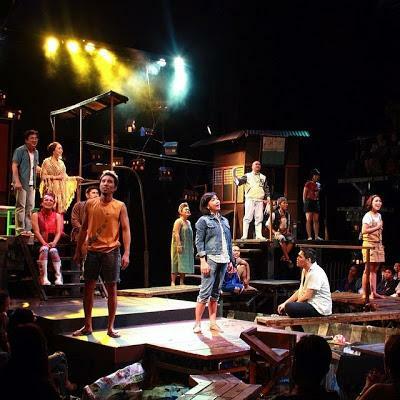 THE PHILIPPINE EDUCATIONAL Theater Association’s “Rak of Aegis,” a musical-comedy production about a fictional urban-poor community coping with floods that features the songs of the iconic pop-rock band Aegis, grabbed the lead in the 1st/2nd-quarter citations of the 2014 Gawad Buhay!, the Philstage Awards for the Performing Arts, with 16 citations in the performance and technical categories. “Rak of Aegis,” written by Liza Magtoto and directed by Maribel Legarda, got nods in the following categories: Outstanding Original Musical, Outstanding Ensemble Performance for a Musical, Stage Direction for a Musical (Legarda), Original Libretto (Magtoto), Musical Direction (Myke Salomon), Choreography (Gio Gahol), Costume Design (Carlo Pagunaling), Sound Design (Salomon and Happy Constantino), Set Design (Mio Infante), Female Lead Performance in a Musical (Aicelle Santos and Joan Bugcat), Female Featured Performance in a Musical (Kalila Aguilos) and Male Featured Performance in a Musical (Salomon, Pepe Herrera, Jerald Napoles and Juliene Mendoza). Meanwhile, Repertory Philippines’ production of Tracy Letts’ Pulitzer- and Tony-winning play “August: Osage County,” directed by Chris Millado, followed closely with 13 citations. It was cited in the following categories: Outstanding Production of Existing Material for a Play, Outstanding Ensemble Performance for a Play, Outstanding Stage Direction for a Play (Millado), Lighting Design (Katsch Catoy), Sound Design (Jethro Joaquin), Set Design (Miguel Faustmann), Female Lead Performance in a Play (Baby Barredo), Female Featured Performance in a Play (Pinky Amador, Liesl Batucan, Shiela Francisco and Tami Monsod) and Male Featured Performance in a Play (Richard Cunanan and Hans Eckstein). Tanghalang Pilipino’s production of “Mga Ama, Mga Anak,” a translation into Filipino by Virgilio Almario and José Lacaba of Nick Joaquin’s short story and later three-act play “Three Generations,” got eight nods, including citations for its two alternating male leads (Robert Arevalo and Spanky Manikan) and three of its featured female actors: Madeleine Nicolas, Celeste Legaspi and Banaue Miclat. Tying with the eight citations of “Mga Ama, Mga Anak” is Resorts World Manila’s production of the musical “Priscilla, Queen of the Desert,” under its newly formed Full House Theater Productions (the newest member company of Philstage). “Priscilla” received nods for, among others, Outstanding Production of Existing Material for a Musical, Outstanding Stage Direction for a Musical (Jaime del Mundo) and Male Lead Performance in a Musical (Red Concepcion). In dance, both Ballet Manila’s “Aramica,” choreographed by Bam Damian for BM’s “Heart2Heart: Ballets and Ballads” production, and Ballet Philippines’ “Muybridge Frames,” choreographed by Denisa Reyes for BP’s “Art of Dance,” got four citations each. Now on its sixth year, Gawad Buhay! is the first-ever industry awards exclusively for the performing arts juried by an independent panel of critics, scholars, artists and theater enthusiasts. Outstanding individual and group achievements in various artistic and technical aspects of play, musical and dance productions and performances are honored based on quarterly citations deliberated by members of the jury who are required to watch all productions of Philstage member-companies for the entire year. From the four quarterly citations, the jury will select the final nominees qualified to win the awards by the end of the performance season. Awarding ceremonies will be in early 2015. Philstage is the only alliance of professional performing arts organizations in the Philippines. Its members include Ballet Manila, Ballet Philippines, Gantimpala Theater Foundation, Organisasyon ng Pilipinong Mang-aawit (OPM), Peta, Repertory Philippines, Tanghalang Pilipino, Trumpets, Actor’s Actors, Inc., 9 Works Theatrical, and Philippine Opera Company and RWM’s Full House Theater Productions.